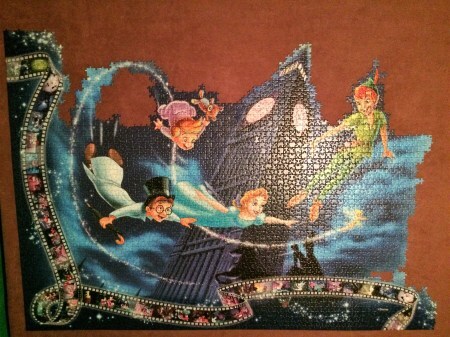 Peter Pan was the fourth section of this puzzle completed, and for me it was the most difficult. I was certain Fantasia would be the most challenging, but I was wrong. I'm sure others who have finished this puzzle have their own ideas on each section, but for me this section was the most difficult to get through. I knew this section would be tough, which is why I chose to assemble it early on. Once I had all the "difficult" ones done, all that would be left are the brighter, more colorful sections. It was my way of trying to make sure I didn't get discouraged by the enormity of my task and keep myself motivated. 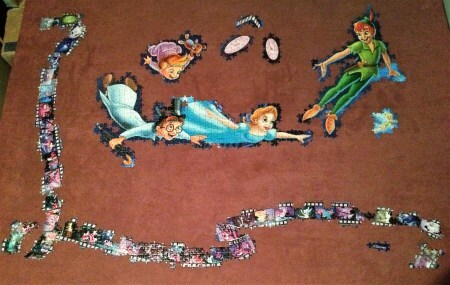 After the first few days I had assembled most of the film strip, the faces on Big Ben's tower, and all the characters. The colors of the characters were bright and easy to pick out and made an excellent starting point. 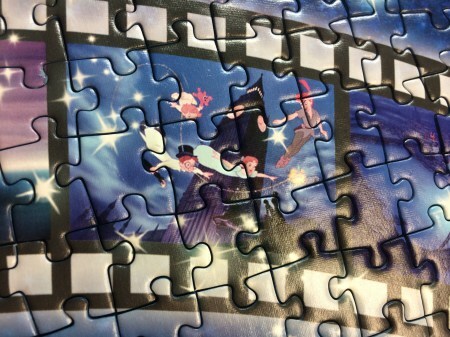 This section is one of the corners of the puzzle so the filmstrip borders 2 sides; seeing all the scenes depicted in the strip was fun and in this section the scene shown as the main image is also shown in the filmstrip itself. The stars here are bigger and brighter, but this is exactly the large scene I'm assembling! This didn't happen with any of the other sections, and I found it pretty interesting. It's also good for showing how detailed the filmstrip scenes are; each cell was made up of between 12-20 pieces and were all wonderful images from each movie. This is after a few more days of work. Once I got the pixie dust going I was able to connect Wendy, John, Michael and Tinkerbell. It's always satisfying for me to get smaller sections connected to each other. 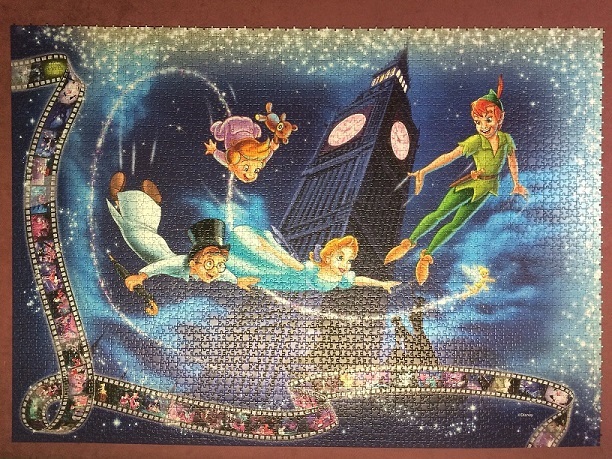 Once I put Peter where he goes I was only missing one piece to get him connected to Wendy, and it fortunately had a bit of pixie dust too so I was able to find it quickly - the pixie dust was the key! Filling in the dark blue starry pieces between the filmstrip and the edges wasn't too bad, and luckily they were a different shade of blue than the rest of the puzzle. 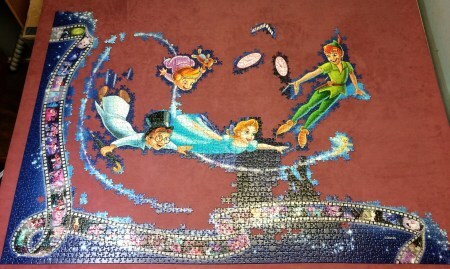 Now begins the hard part, the entire rest of the puzzle is made up of blue/dark blue/dark pieces - more than 2000 of them! Amazingly, even assembling all that sky with different shades of blue didn't becoming too overwhelming or tedious for me. This section was very dark, so my apologies for the glare you're seeing in some of the pictures. All of them were taken at night after I was done working for the day; the artificial lights and the dark pieces didn't play well together. And here it is, completed in 15 days! It was nice to have several large characters to assemble instead of one giant elephant. I was pretty darn proud of myself for sticking with it and assembling all of that dark sky - so much blue! I thought when I started this project that I would need to take breaks in between each section, maybe a week or two, to keep from being bored with it or becoming overwhelmed. I was completely wrong! As soon as I finished one I was raring to get going on the next one. Even though they were big and intimidating I loved every section, even the hard ones, and couldn't wait to see what challenges the next section would hold. 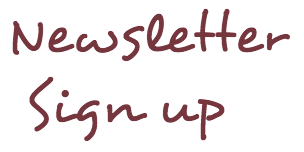 If you'd like to see the daily progress made on this section click here to see the first day of work and scroll towards the bottom of the page to click next and watch it come together day by day. Up next to get us to the halfway point in this entire assembly - The Jungle Book, my favorite Disney movie!